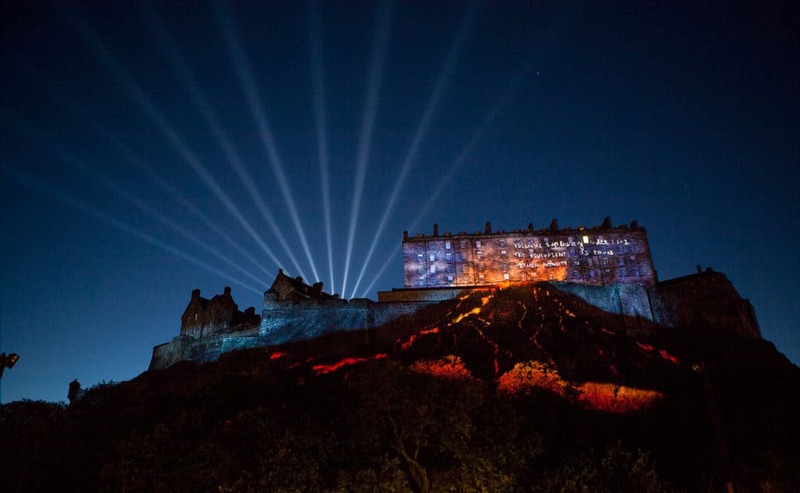 Opening the Edinburgh Festival in 2016, Deep Time was an epic, outdoor, public artwork, bringing together spectacular animation, lighting and music, and delving deep into 350 million years of Edinburgh’s history. Set to a specially compiled soundtrack of contemporary Scottish music and produced by Tony Award-winning 59 Productions, creators of the acclaimed Harmonium Project that launched the 2015 International Festival, the event also marked the first year of a three year residency for 59 Productions at the Edinburgh International Festival as Artistic Associates. Deep Time reimagines the ancient site from which Edinburgh sprang, using iconic Edinburgh Castle and Castle Rock – a volcanic plug of 350 million-year-old dolerite – as the rugged canvas for spellbinding projections and illuminations inspired by the deep geological history of this unique location. Edinburgh-born James Hutton is considered the father of modern geology: it was Hutton who in the 18th century proposed that the Earth was billions of years old, drawing on evidence he found in the city around him. Deep Time celebrates Edinburgh as the city that inspired our understanding of the world’s deep history, and Hutton’s ideas of discovery and logic through the prism of time and geology. And in Scotland’s Year of Innovation, Architecture and Design, Deep Time also reflects on Edinburgh Castle, one of the longest continually inhabited sites in Scotland – from a Bronze Age settlement to the spectacular edifice we see today, across almost 3000 years of Scottish history. Blending trailblazing technology, narrative drama and emotional storytelling, Deep Time celebrates the wonders and beauties of the natural, the geological and the man-made, exploring the very foundations of Edinburgh itself.